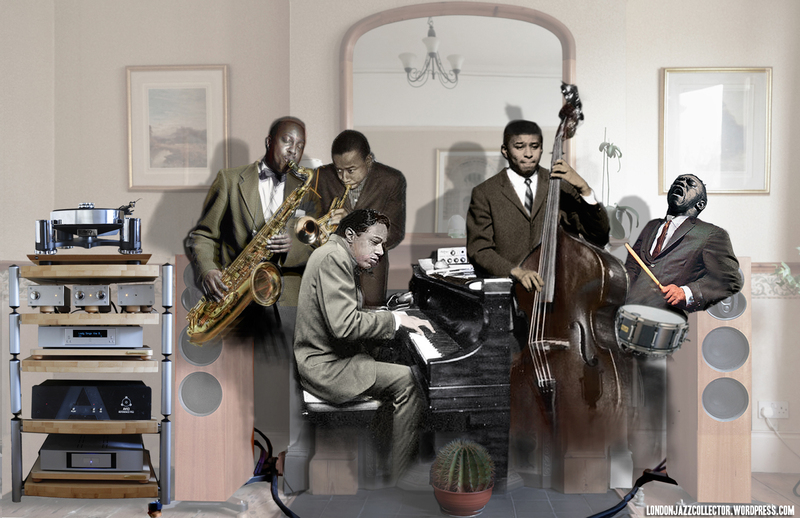 A London suburban home, with musicians in the room – The Jazz Messengers: musicians long-dead, their genius available only through their recordings. The message of the image is vinyl, which recreates the musicians not just from the speakers, but as physical presence in the room itself, exclusively for you. Why exclusively? Because due to economics the modern live venue is often a large concert hall, or worse, an open air festival, with the sound mixed and then pumped into overhead giant speakers, no longer bearing any resemblance to the instrument of origin. Audiences are mostly the entertainment-seeking evening out crowd. Nothing wrong with that, but a truly hip audience would breathe “yeah”, maybe a polite patter of applause. We know it’s good. I’ve walked out of several festivaI concerts recently, Hancock, Corea, McLaughlin, dreadful, I gave up. Small intimate settings are a different story, a benchmark which Hifi only aspires to, but since most of the people I listen to are dead, that is never going to happen. I settle for a front-row seat in an intimate setting in say 1957, which is what vinyl offers. Below, the original banner with which I launched LondonJazzCollector blog in August 2011 – a vision which came to me in the early waking hours one morning, and which I struggled to realise that day in Photoshop, with images snatched for many sources online, then blended, toned and colourised in multiple layers until it approximated to the picture in my head. Photoshop art by LJC; turntable by Avid Hi Fi Ltd, first stage valve amplification by World Designs and main power amp and speakers by Linn Hi fi Ltd; interconnects and power cables by Kimber and Russ Andrews Accessories; HiFi staging by Atacama Engineering. So, is there an album with this particular line-up of Morgan, Mobley, Silver, Chambers and Blakey? That rhythm section played on Rollins Vol 2 (BLP 1558) but never again. I’d like to state for the record that the graphics on this website are the best on the internet. The label photos with the etchings are a triumph of photographic, lighting and Photoshop skill, the Esquire cover format diagrams are models of clarity, and the wit of the non-smoking covers is delightful. It’s all done beautifully. I love this site. The first edition of “Musicians in the Room” looks better. Like so many of the great albums you review, they got it right on the first press, then went back with the best of intentions a few years later to tweak it but lost the spirit of the original. The original banner works so beautifully because subliminally every viewer knows what this blog is about without reading a word – bringing the music of these great musicians back to life in ones living room through original period pressings and a great hi-fi. Having the musicians in black and white as a half tone immediately suggests they are imagined. And the pleasure of achieving this revitalization is conveyed through their witty placement in your wonderful British living room. In the latest banner the musicians appear to be imagining your living room.. I vote for the first edition to sit atop my favorite website. l let the readers decide. So far, you are in the lead John. Well, that is one vote cast in favour of the old banner, and none in favour of the new banner. Time’s up. Since I like them both, but for different reasons, I declare the original banner the winner. Isn’t democracy great? However, I have updated the turntable in the picture to its current status, Avid Sequel with separate power supply. Not that anyone would notice.